There are few places that are as fun to visit during the holiday season than New York City. The lights, the chill in the air, the energy, the music wistfully playing from speakers off of storefronts, and yes, even the smell of chestnuts roasting on an open street vendor’s fire. I look forward to the festivities every year, and though any other time of year I would do everything to avoid the crowds, on Christmas Eve, I find myself joining them in early celebration and fun. Navigating it all can be pretty overwhelming, so here are my tips to ensure you have the absolute best Christmas Eve in NYC. Like, right now. Hotel rooms are hard to come by this time of year and you can expect them to be pricey. Some of my favorite, centrally located hotels are Residence Inn Times Square, which is great for family travelers ,and the citizenM Times Square for a more boutique hotel stay and has a great roof top bar. Of course, more luxury brands, such as The Ritz Central Park and the Four Seasons do not disappoint. It is also worth mentioning that the beauty of spending a little extra on the more central hotels is that you are within walking distance to shops, restaurants, and attractions. The absolute last thing you want to have to do is take a taxi to travel anywhere in the city. It can take you a long time and cost you a pretty penny while stuck in traffic. Shop till you drop at the holiday markets! Though many hotel and business office lobbies seem to out do themselves every year with the largest and most fabulous trees, there are four that you must see before they go dark. 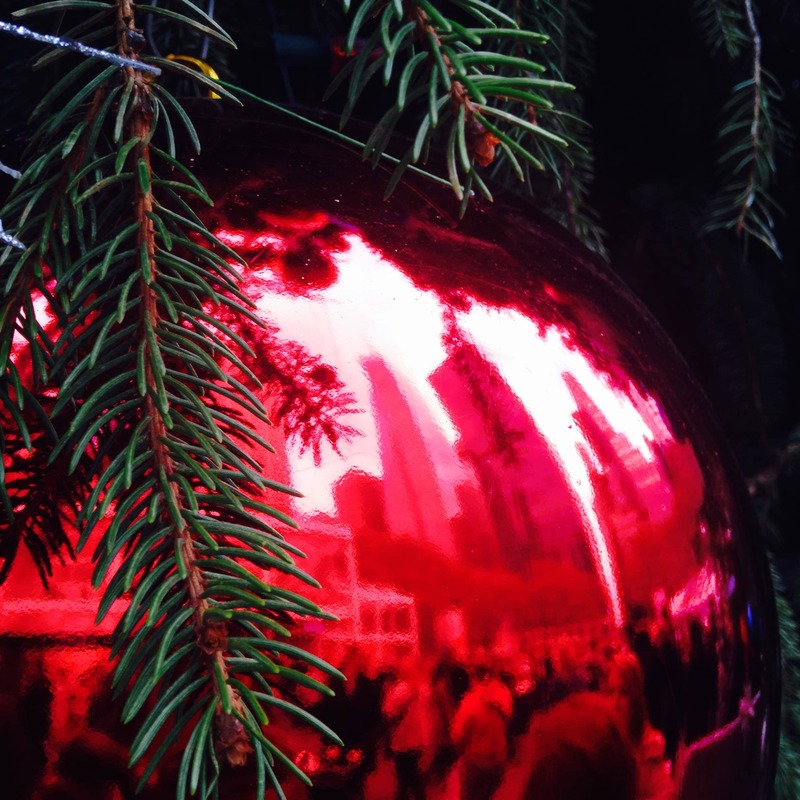 Of course, the famous Rockefeller Tree is a must, as well as the tree at the Winter Village in Bryant Park. Both of these are along the Christmas window walking tour. The tree that shines over the Radio City Music Hall is one of my favorites, as well as the larger than life ornaments nearby on Avenue of the Americas. Head downtown to 14th Street and check out the tree at Washington Square Park, and don’t forget to visit the Union Square Farmers Market nearby. Viewfinder Tip: If in NYC earlier in December, make sure to check out the Unsilent Night event in Washington Square Park. Check out their website for date and time. It used to be that finding a great place to celebrate Christmas Eve was harder than spotting Santa. Just like you can now find Santa on almost every street corner, you can also find a great place to dine—as long as you make a reservation. Some of my favorite spots are ABC Cocina (lower West Side), Red Rooster (Harlem), Barraca (West Village) and Il Buco (Lower East Side). To top it off, celebrating with music and dance in NYC is the most iconic way to enjoy your Christmas holiday. Families really enjoy seeing The Rockettes in Radio City’s Christmas Spectacular and I love the performances at Lincoln Center, but especially the holiday ones. Though the festivities continue in NYC up to the New Year, none are as fun, as colorful, or as joyful as the days leading up to Christmas. Dress warm, be ready to do a lot of walking, and indulge in the holiday spirit, NYC–style. Which is your favorite city to celebrate Christmas Eve?